Shopping for a dog lover this holiday season? From totes to prints to handkerchiefs, we’ve rounded up a robust list of our favorite gotta-have-it gifts. Be sure to check out our other gift guides! What’s The Best Color For A Dog Toy? When you, as a human, want to choose the best color for something—whether it’s a wall in your living room or a sweater to wear to work—you choose based on preference. So, for example, maybe you prefer red sweaters to blue sweaters or think a navy accent wall will look better in your living room than a green one. And that’s a fine way to choose colors for you. But when it comes to figuring out the best color for a dog toy, choosing based on preference just isn’t the right strategy for your pup. So, how do you go about choosing colors for dog toys? Which colors are going to be easy for your pup to see—and which are going to be more challenging? And what, exactly, is the best color for a dog toy? 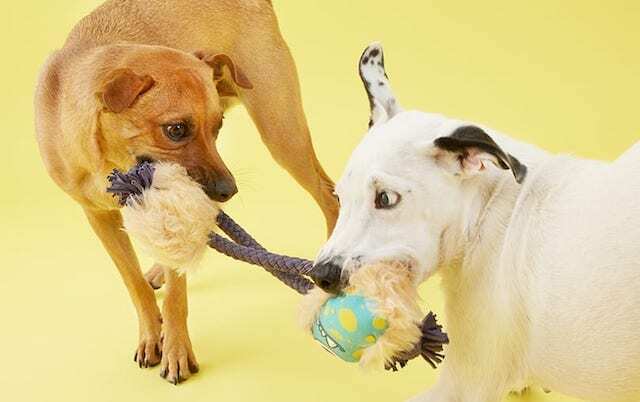 Before we dive into which color is best for a dog toy, it’s important to understand how dogs experience color—and how that differs from humans. Many people think that dogs can only see black, white, and various shades of gray, but that’s not true. Dogs can see colors, just fewer colors than their human counterparts. And the reason? They don’t have as many cones. Cones are photoreceptor cells in the eye that allow you to see color. Humans have three cone cells in the eye, which allows us to see red, yellow, green, and blue wavelengths. But dogs only have two cones that allow them to see blue and yellow wavelengths—which means, for all intents and purposes, they’re red-green color blind. Understanding how a dog experiences color—and which colors they’re unable to detect—is super important when choosing the color for your dog toy. So, for example, let’s say you want to buy a Fetch Toy for your dog to play with at the big, grassy dog park down the street and you see a red ball on sale at the pet store. Should you buy it? The answer is no. Or at least, it’s ‘no’ if you’re concerned about your dog detecting the color. Remember how dogs are red-green color blind? That means their eyes can’t detect either red or green—and, as a result, both colors will appear as a yellowish-gray. So when you throw a red ball across a green grass, it’s going to be impossible for your dog to distinguish the red ball from the green grass. Not exactly fun for your four-legged pal. But if you throw a blue ball, like the “Orbee Globe Ball,” it will stand out against the green (or, as they see it, yellowish-gray) and make it easy for them to spot, chase, and play with—which makes it a solid color choice for your dog’s next ball. What Is The Best Color For A Dog Toy? So, it all comes down to the million dollar question: what is the best color for a dog toy? If you’re playing with a toy outside, definitely go with blue, which will create a good contrast with the grass, making it easier for your dog to see. If you’re playing inside, you have a little more wiggle room and can go with any colors your dog is able to see—like blue, yellow, or purple (which your dog will register as a darker blue). Want to make sure your pup has plenty of toys (in the right color) to keep them busy? Then you’ll definitely want to check out BarkBox. 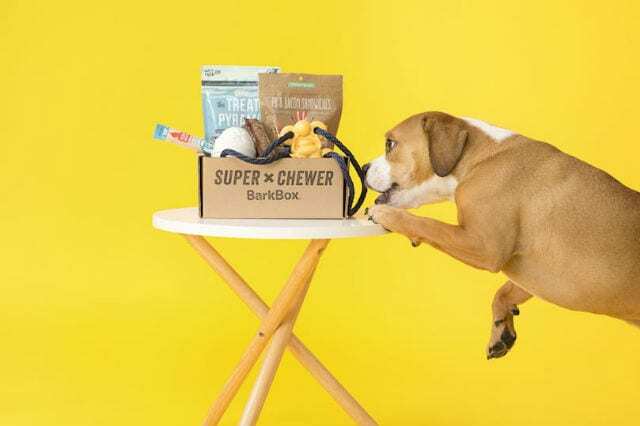 With this monthly subscription box, you’ll get 2 carefully curated dog toys, 2 bags of yummy treats, and a long-lasting chew delivered to your door every month. Plenty to keep your pup entertained all month long! The post What’s The Best Color For A Dog Toy? appeared first on BarkPost. How Do You Get A Dog A Gift? They’re funny. They make you laugh. They’re the best companions. They infuse every day with joy. They’re just all-around amazing. There are a million reasons to give your dog a gift. And when it comes to gifts for your pup, only the best will do. But what, exactly, are the best gifts for dogs? How do you get a dog a gift you know they’ll love? When it comes to choosing the best gifts for your dog, think about what they love. Are they food motivated and would do just about anything for something tasty? Then a yummy new bag of treats is sure to hit the perfect gift-giving mark. Do they never get tired of running around and playing? Then a new Fetch Toy is a great gift idea. Do they love to be challenged? A Thinker Toy will engage their brain and give them hours of enjoyment. The point is, the best gift for a dog isn’t universal; it all depends on your dog, what they love, and what’s going to make them happiest. If you’ve got a playful pup with lots of energy, getting them a new Dog Toy is a great gift idea. Toys can help them channel their energy into something positive (instead of getting into trouble!) and will provide hours of entertainment. If your dog likes to play outside, a fetch toy like the “Best Balls Ever” will have them running in circles (in a good way!) next time you head to the park. If your dog is more of a homebody, a Thinker Toy like the “Dog Casino Puzzle” will keep them engaged and entertained while they’re lounging around the house. And Tug Toys (like the “Tea Bea“) and Plush Toys (like the plushy “Jack Spaniels“) are a hit with active dogs and lap dogs alike! Playing is super fun for pups. 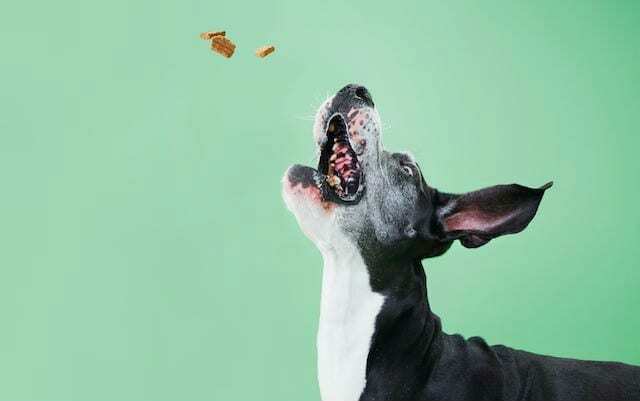 But so is eating—which is why Dog Treats are such a wonderful gift for your dog. There are tons of different types of treats (like freeze-dried treats, biscuit treats, and jerky treats) so get a few different kinds until you find the type, texture, and flavor that’s best for your pup. Once you find their favorite, it’ll make the perfect gift for any special occasion, to reward their good behavior, or just because! Taking care of your pup’s chompers is important—but Dog Chews are just as fun for your pup as they are good for their teeth, which is why they make a great gift! There are lots of different types of chews (like the Beef Knee Cap Chew or the Chicky Twizzle) to choose from—just make sure you pick a chew that’s the right size for your pup. Then, gift away! BarkBox: The Ultimate Dog Gift! Toys, treats, and chews are all great gifts for dogs, but why settle for one when you can have all three? With BarkBox, you’ll get a carefully curated selection of two toys, two yummy bags of treats, and a long-lasting chew delivered to your door each month. 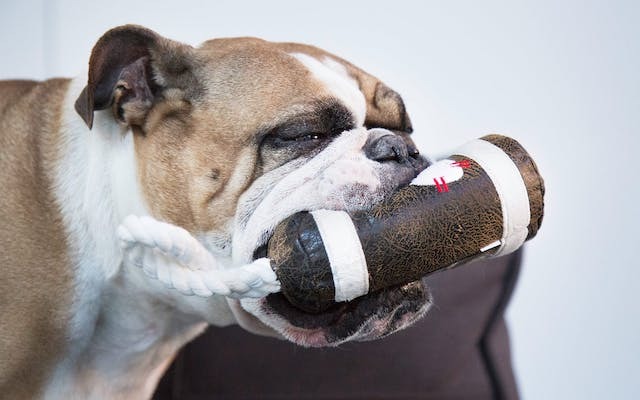 Or if your dog goes all-out on the chewing, consider upgrading to the Super Chewer BarkBox for super-durable toys and an extra long-lasting chew. Giving your dog BarkBox is the ultimate gift – and trust us when we say they’ll thank you for it. The post How Do You Get A Dog A Gift? appeared first on BarkPost. What Is A Starbucks Puppuccino? Next time you pull up to the drive-through window at Starbucks, make sure to order your dog a treat too! Yes, Starbucks absolutely serves our furry friends, in the form of Puppuccinos. They’re a super delicious treat that will make your dog fall in love with Starbucks just like you have. A Puppuccino is a very simple thing. It’s just a small Starbucks cup of whipped cream, made especially for your dog. There’s no coffee, tea, or caffeine of any kind in the cup — just straight-up whipped cream. How Do You Order a Puppuccino? This is one menu item you can’t order through your Starbucks app, but you probably wouldn’t be using your app if you’re hitting up the drive through with your dog in tow. Just tell your barista you have your dog along for the ride and you’d like a Puppuccino. They’ll know exactly what you’re talking about. While your dog should usually only eat dog food, there’s nothing wrong with the rare Starbuck’s Puppuccino as a special treat. Unless your dog has digestive issues – in which case it’s probably best to not give them a Puppuccino. If you’re worried about giving your pup a Puppuccino, consider running it past your vet first. How Much Do Puppuccinos Cost? Puppuccinos are a freebie, but that doesn’t mean you should get a bunch of them every day! Starbucks loves dogs just as much as you do, which is why they don’t charge for Puppuccinos. However, it wouldn’t hurt to throw in a bit of a tip on top of your drink for their kindness. We think your dog would agree. The post What Is A Starbucks Puppuccino? appeared first on BarkPost. What Are Dog Toys Stuffed With? Most dog owners are familiar with the carnage that usually follows the act of giving your dog a new Plush Toy. Within hours, minutes, even seconds of receiving their gift, your pupper has absolutely shredded their toy, raining fluffy white clouds of…well…actually, what are those fluffy white clouds made of? Polyester Fiber Fill Means…What Again? As with stuffed toys for humans, most stuffed dog toys are filled with something called polyester fiber fill. You may be familiar with polyester – chances are some of your clothes or household items contain it. But what exactly is polyester? Simply put, polyester is a type of plastic. And polyester fiber fill is more or less just what it sounds like: plastic formulated into strands or fibers that can be used as stuffing for a whole slew of toys for dogs and humans alike. While we tend to think of plastic as a not-so-healthy substance, the truth is it’s considered relatively safe for use in toys, even ones your dog puts in their mouth. Now that doesn’t mean you should go and let them eat the stuffing after they’ve shredded their new Christmas present! Polyester fiber fill can get stuck in your dog’s digestive tract and cause issues, so it’s best to dispose of the plastic viscera post-shredding. There are of course other types of dog toy stuffing out their in the world. Some are variations or close relatives to polyester fiber fill. Others still have more organic origins like cotton or corn fiber. Regardless of what it is or where it comes from, as with all food or toy items you give to your dog, it’s a great idea to check out what it’s made of. It’s all in the name! Tug toys are for doggos who love a good game of tug o’ war with their humans or dog friends. And most tug toys contain a plushy element that dogs can shred as well. Don’t know exactly what kind of tug toy your canine pal might be into? Check out “Bruno Branches Out,” the “Hide-N-Go-Zeke” Tugimal, or the “Tea Bea” Tug Bug for starters. Spiky Core Balls Toys are a great gift for dogs who love shredding their toys and playing with squeaky balls. Toys like “Monsieur Acorn,” “Consuela the Cactus,” or “Penny the Pineapple” can be squeaked and played with long after they’ve shed their plushy exterior. It’s a classic doggy twofer. Which Toys Don’t Have Stuffing? Maybe you’d rather your dog not rip their toys to shreds. If that’s the case, check out a classic rubber Super Chewer Toy like “Llana the Iguana” or something nylon like the peanut-butter-infused Benebone. If you like your dog’s toys filled with stuffing, considering subscribing to the classic version of the BarkBox. You’ll get 2 stuffing-filled toys, 2 bags of treats, and an all-natural meaty chew delivered to you every month. Or if you’d rather have some stuffing-less toys, upgrade to the Super Chewer version of the BarkBox. For just a few dollars extra, the toys are super-durable and you’ll get 2 meaty chews instead of one. The post What Are Dog Toys Stuffed With? appeared first on BarkPost. What Should You Do If Your Dog Ate A Tampon Or Other “Personal Item”? Your dog has a dirty little secret: he (or she) is obsessed with your most intimate personal items. To them, your used tampons, sanitary pads, condoms, and dirty underwear are like forbidden candy. But this habit is more than just gross and creepy, it can be downright life-threatening. If your dog ate a tampon or other personal care product, contact your veterinarian immediately! What makes tampons and pads so dangerous? Diapers, tampons, sanitary napkins, and toilet paper are designed to absorb liquids. When swallowed, they immediately begin to soak up the gastric juices in the digestive tract and swell in size and density. This robs the dog of vital fluids and puts them at risk for a life-threatening intestinal blockage. Unused and high absorbency tampons are especially dangerous. Even the tiny string attached to a tampon can cause serious damage if it becomes tangled or tears away at the lining of the esophagus or intestines. How about condoms and other personal items? Items like condoms and menstrual cups are non-absorbent, but may still pose a threat. According to Dr. Claire Jenkins of the online veterinary consultation site, VetChat, it often comes down to size; both of the dog and the item. Why, oh why would a dog eat a tampon, pad or condom? Dogs explore the world through their mouths and noses. When faced with a pungent odor, your dog can’t help but explore it. Check out this video to see just how powerful your dog’s nose really is. They are scavengers by nature. Wild canines prefer live prey, but will also scavenge for carrion when necessary. To your dog’s powerful nose, discarded tampons, pads and condoms reek of decaying biologic material. You are your dog’s favorite smell. Chances are your pooch loves to snuggle up on your discarded hoodie, especially if you just got home from the gym. To your dog, your unique aroma is the best smell on earth, and nothing carries your scent better than bodily fluids. What should you do if your dog ate a tampon or condom? Don’t panic. Your first instinct might be to freak out, not only because your dog might have eaten something dangerous, but because now you’ll have to have that awkward conversation with your vet about how many used tampons your dog has fished out of the bathroom trash can. Contact your vet. Pups eat weird things all the time and then poop them out, but that doesn’t mean you should wait until your dog shows signs of illness. If you know your dog ate a tampon or other personal care product, call the animal hospital right away. Based on your dog’s size and what he or she ate, the staff can advise you on what to do. They may suggest X-rays and an exam, or have you monitor your pup’s appetite and bowel movements. If your pup seems ill or you just cannot shake your anxiety, head to the vet. You can’t put a price tag on peace of mind! Lock yo’ stuff away! Your pup might have pooped that tampon out this time, but you’d rather not go through that again. Intestinal blockage is no joke! Try keeping your products out of reach of any paws, or invest in those handy safety locks people use for childproofing. If your pup likes eating used sanitary products (cringe) get a trash can with a lid. Anything to keep your pup safe! Crack all of the jokes. If your dog is safely tampon/sanitary napkin/condom free and you’ve made sure to take all the steps possible so that this never happens again, breath a sigh of relief and then go ahead and make lots of jokes. You’ve earned it! Provide lots of stuff your dog CAN chew on. If your dog ate a tampon or other personal care product he may be trying to tell you he’s bored. Even if your pooch has plenty of toys, he could be tired of the same old plushies and squeakers. Expand his play-horizons with a monthly box of goodies from Bark! Every BarkBox has at least 2 innovative toys, 2 all-natural bags of treats, and a chew, curated from each month’s unique themed collection. Our treats are made in the USA and Canada, and our recipes never contain any wheat, soy, or corn. Because we want #BarkBoxDay to be incredible for pups AND their parents, every box is wrapped in a fun surprise theme that changes monthly. Sign up here and receive a free extra toy every month. <– This deal is worth up to $120 in value if you sign up for a 12-month subscription! The post What Should You Do If Your Dog Ate A Tampon Or Other “Personal Item”? appeared first on BarkPost. The post What Are The Best Toys For Yorkies? appeared first on BarkPost. What Are The Best Toys For Australian Shepherds? Australian Shepherds are a fun loving and hardworking breed. Extremely energetic, they need plenty of exercise and require mental simulation to keep them happy. While these special pups have a flair for herding and agility courses, not everyone has a farm or obstacle course on hand. So we’ve assembled a list of the best toys to entertain and sharpen your Australian Shepherd during play time! Australian Shepherds love to chase and run. They’re a highly active breed that requires a good deal of exercise. Fetch is the perfect way for them to zap that energy and get moving. And while tennis balls are a classic go-to, the “Best Balls Ever” have a fun squeak, which adds a twist to this traditional fetch staple. Australian Shepherds are known for their intelligence. Dog puzzles like the “Dog Casino Puzzle” are a great way to keep their minds sharp. BARK has a whole bunch of food-motivated Thinker Toys to challenge your pup, from intermediate to advanced, so check them out! Like most pups, Australian Shepherds enjoy a good game of tug. It’s an exciting playtime for them, and a bonding opportunity for you both. The “Rope Pretzel Toy” is a t-shirt rope covered in durable nylon, and it fits in your pup’s mouth and comfortably in your hand. Perfect for tug-of-war! Multi-Part Toys are a dream for a parent of an Australian Shepherd! There are different ways to play with one set of toys. “Chester’s Nuts” and “Peas in the Pod” are fun and versatile. Each set has pieces that are great for fetch. To get their brains thinking, hide treats inside the pouches and watch your pooch work for their reward! If you’re looking for super fun Multi-part sets, innovative tug toys, or grain-free treats, BARK has you covered! The Classic BarkBox comes with 2 toys to keep your pooch entertained and occupied, 2 bags of treats, and a drool-worthy chew! For the Australian Shepherds who easily crush the plush, the Super Chewer BarkBox is right up your alley with 2 toys, 2 yummy bags of treats, and 2 all natural chews. Each month is a new theme and a new box of toys and treats to get that tail wagging! The post What Are The Best Toys For Australian Shepherds? appeared first on BarkPost. There’s a reason that you see oodles of Doodles everywhere these days. They are all unique in their own doodly way, but if they share one quality, it’s that they are all basically dogs trapped in the body of a teddy bear. So without further adoodle, here are some things that only Doodle parents know to be true. 1. They’ve perfected the head tilt and let you know when they’re listening intently. 2. They belong in Sock Snatchers (or shoes, gloves, bras, undies!) Anonymous. 3. You know that the struggle to stop at one Doodle is very, very real! 4. Cheese? Hot dogs? Pizza? Chicken wings? Whatever it is, if it’s near the edge of the counter, it’s theirs. Doodles are professional counter surfers. 5. It’s a bird! It’s a plane! It’s Superdoodle! They somehow defy gravity when running! 6. They’re basically fluffy people. They can reason with you (very well, we might add!) with their eyes. 7. Balls! Rubber balls. Tennis balls. Any balls. Instant love affair. 9. Doodles are a part of the family… perhaps even the CENTER of the family! They just love to steal the spotlight! 10. 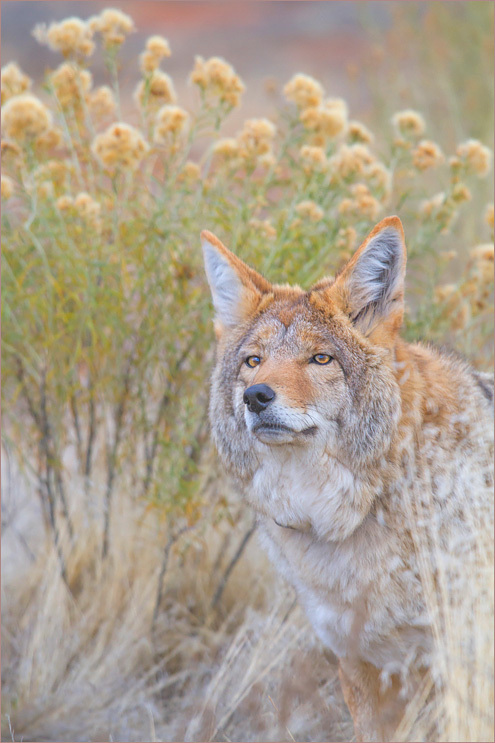 Their expressive eyes are almost humanlike, and boy do they know how to work it! When Doodles give you the side-eye, you know they mean business! 11. When dropping your Doodle off at the groomer, the phrase “Don’t Poodle my Doodle” has come out of your mouth. 12. They are extremely intuitive (maybe a little too much), which makes them excellent therapy dogs! 14. Zoomies… those moments when your Doodle gets briefly possessed, acts insane, and quickly dashes around the room for no apparent (but very important) reason. 15. Who knew?! Doodles are hound dogs at heart! They can sniff out toilet paper, tissues, and napkins 100 yards away! 16. You’ve caught your pup in “the doodle pose”… sleeping on his back, paws in the air, neck bent to one side. 17. You may never go to the bathroom alone again. Labradoodles will never, ever leave your side… EVER!… and you would never want them to. The post 17 Things All Doodle Parents Know To Be True appeared first on BarkPost.